Congratulations to Natalie Atkinson & Sandy Pack, our Memorial Champions for 2015. 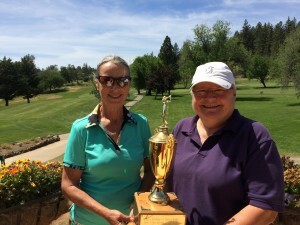 In a 36-hole event with an Eclectic Format (where the 2nd round is used to improve on your first round scores hole by hole), the team of Natalie Atkinson & Sandy Pack came from behind, making 13 improvements from their previous round to claim the trophy with a sizzling NET 53. In the closest contest in years, FOUR teams tied for second place with NET 54’s. Wow! Nice job, Ladies!